The service in management consulting is very popular in Uzbekistan now, considering a wave of changes in the legislation in the field of business activity, and also regional specifics of business. Even more often demand for integrated management of the enterprises, including personnel recruitment, financial accounting, legal services, and also business process optimization in general grows. Management consulting represents TEAM work of specialists of different fields of activity (financial, legal, personnel and managerial). Team work on the certain, initially verified scheme of business allows the client to find effective, highly professional result. 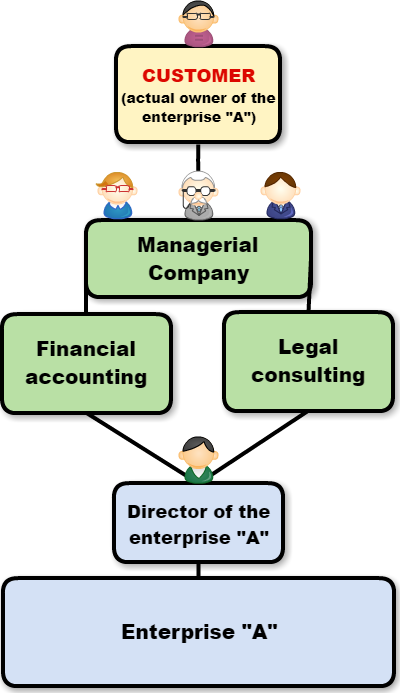 After registration of the enterprise there are many initial steps directed by system of maintaining the financial reporting and document flow in general, and timeliness of this procedure further existence of the enterprise within the law, and also avoidance of possible problems depends further on literacy. 3. Legal consulting (development of the following documents: labor agreements and orders, the order on introduction of the staff list and the staff list, the order on introduction of the scheduled plan of issues, the agreement on a financial responsibility, the agreement on confidentiality, the order on introduction of employment policies and procedures, studying, adjustment and completion of agreements on profile activity, the order and the instruction on fire safety, the order and provision about accounting policy of the enterprise, studying, adjustment and completion of personnel documents of the enterprise, the order and regulations on compensation and awarding at the enterprise, basic job descriptions, consultations in full on activity of the enterprise and its optimization).